Fr Oliver McCrossan, Fr Bernard Steed, Angie Escarsa and Fr Barry Maguire. 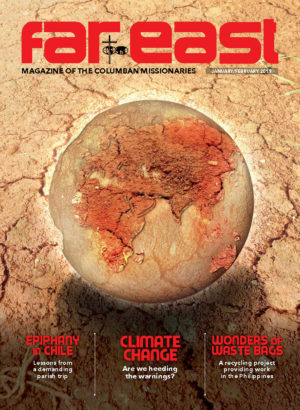 The Columbans are one of the missionary groups that began in Ireland following the 1916 Easter Rising and the dreams it engendered of giving one’s life for a greater ideal, a new vision. China was the Columban vision and it attracted young women and men of that time to take up the challenge and go. Today over 600 Columbans priests, sisters and lay people continue to live out that vision in countries around the world. Columban mission could not continue without the help of our supporters here in Ireland. 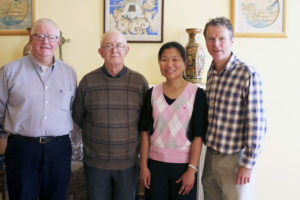 At present the mission promotion team consists of one lay missionary and three priests who have worked in Philippines, Korea and Ireland. They are Ms Angie Escarsa, Fr Barry Maguire, Fr Bernard Steed and Fr Oliver McCrossan. The team visit parishes at weekends. 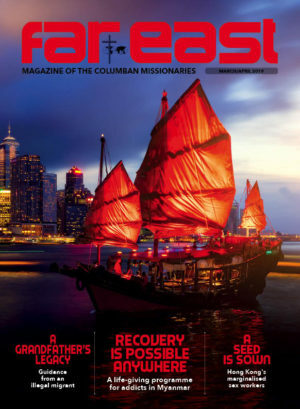 They speak at all the masses inviting people to subscribe to our magazine, ‘The Far East’ or to give a donation to support our mission work. We also take the opportunity to thank our supporters and benefactors for their generosity and prayers. As members of AMRI (the Association of Missionaries and Religious of Ireland) we are given two dioceses each year. This year 2017, we are in the dioceses of Kilmore and Limerick. We are grateful for the generosity of our supporters over many years which we rely on to fund our missionary work. We hope that many others will join them and become our partners as we approach our centenary year in 2018.